First Ever Freddie For A Day Boston at Oberon! Wear something yellow and get your moustache ON! Freddie For A Day was launched in 2010 and is held every September 5th, Freddie’s birthday. People around the world celebrate Freddie For A Day or FFAD in every way imaginable. All ages have donned a moustache and gone out for drinks, gone to class, gone shopping, taken the train, taken the plane, put on a concert or run a mini-marathon dressed as Freddie. Come celebrate the life of the iconic Freddie Mercury, lead singer of the legendary band Queen. Go ahead…get your mustache on! and enjoy the hit songs performed by local talent The Womps, No/Hugs, and Dan Masterson. This year for the first time ever in Boston Freddie For A Day will be happening at Oberon A.R.T. There will be several local bands performing Queen’s music. The event is sponsored by Boston radio station WMEX AM 1510 with host Michelle McPhee as emcee. Freddie Mercury was noted for his live performances, which were often delivered to stadium audiences around the world. A writer for The Spectator described him as "a performer out to tease, shock and ultimately charm his audience with various extravagant versions of himself. Queen guitarist Brian May wrote that Mercury could make "the last person at the back of the furthest stand in a stadium feel that he was connected." In a recent phone interview with Producer/Organizer, Jen Minor of Oberon I learned that The Freddie For a Day initiative is a celebration of the life of Freddie Mercury to bring people together and to fight AIDS worldwide. Beth Redmond Walsh: I had never heard of Freddie For A Day until a few days ago when I learned that Oberon is featuring this event. Could you tell me how this got started here in Boston? It’s never happened here before, has it? Jenn Minor: That’s right. This is the first time FFAD will be happening in Boston It has been going on yearly on Freddie Mercury’s birthday, September 5th. They’ve been doing this in Austin Texas where they’ve had five of these events so far. BRW: I read that the event is sponsored by Boston radio station WMEX AM 1510, isn’t it? JM: Yes with WMEX AM 1510’s own Michelle McPhee as emcee. BRW: So basically you’re the reason we’re actually starting to learn about Freddie For A Day. How did you get interested in this, Jenn? JM: I’m a filmmaker and I've been doing a documentary about Queen and Freddie Mercury, about his fans and performances. It was in Switzerland where I first heard of FFAD last year when I attended a Freddie Mercury birthday event in Switzerland. I met Jim Beach the long-time manager of Queen and Brian May lead guitarist and also Freddie’s personal assistant, Peter Freestone. BRW: Can you tell us a little about what we’ll see at the show? JM: Sure. We have three different bands lined up who will be performing Queen pieces. The Womps, No/Hugs, and Dan Masterson will be there. 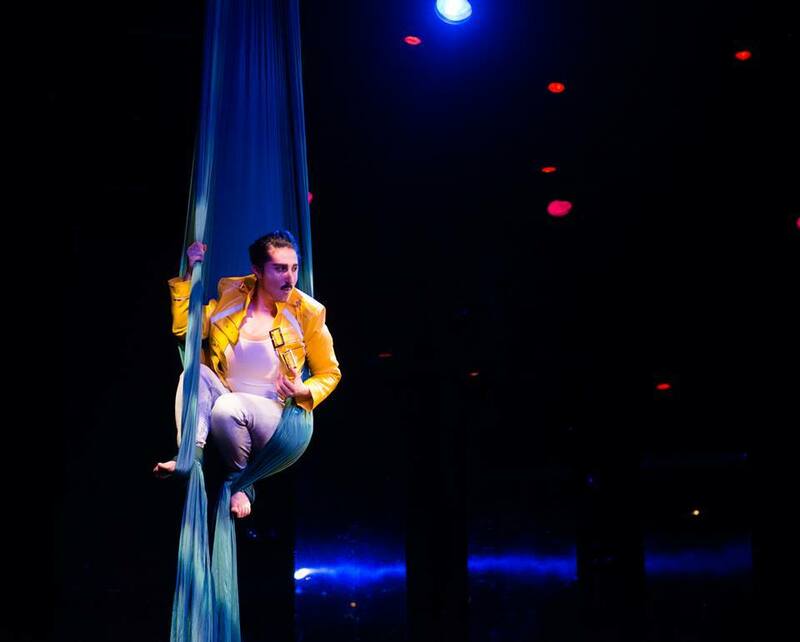 There will also be Ari Green a Silk Aerialist doing a performance as Freddie Mercury himself! BRW: It sounds fantastic! I did some research to learn about silk aerialists and I’ll just say I would go to this show just to see that! But it all sounds great. So what else can we expect with this event, Jenn? JM: There will be specialty drinks at the bar and all the drink proceeds will go to Mercury Phoenix trust to support their very important work in the fight against AIDS. BRW: And people dress up as Freddie, which is the most fun part. Get your moustache on, too. Or come as you are. Just come and have a great time helping to support The Mercury Phoenix Trust and The AIDS Action Committee of Massachusetts. The Mercury Phoenix Trust was founded by Brian May, Roger Taylor and their manager Jim Beach in memory of rock band Queen’s FREDDIE MERCURY who died in 1991 from AIDS. advocating at the city, state, and federal levels for fair and effective AIDS policies, conducting cutting edge HIV prevention programs, and providing health and wellness services to people already living with HIV. Founded in 1983, AIDS Action is New England’s largest AIDS service organization.